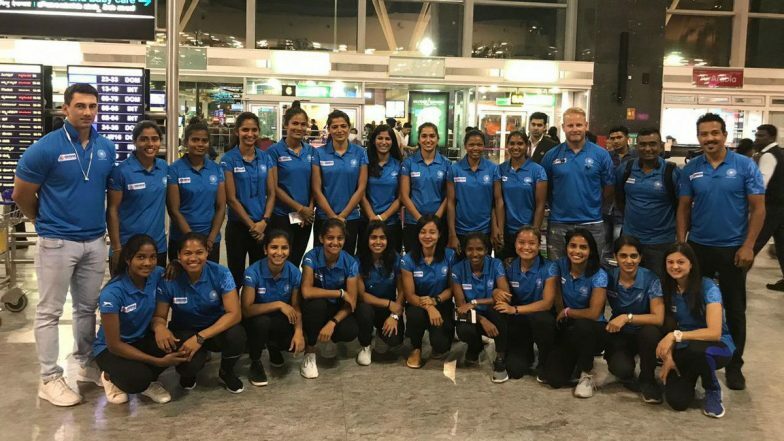 Kuala Lumpur, April 3: High on confidence after a spate of good results, the Indian women's hockey team, led by ace goalkeeper Savita, will start as favourites in the five-match series against Malaysia beginning here on Thursday. The Indian team go into the series after a successful outing in Spain earlier this year, where it beat hosts and 2018 world cup bronze medallists, once (5-2), drew twice (1-1 and 2-2) and lost once (2-3). The Indian team had further improved its performance by holding last year's World Cup runners-up, Ireland to a 1-1 draw before registering a 3-0 win. Indian Women's Hockey Team to Play Five-match Series Against Malaysia. "Always raising the bar is not easy, that demands discipline and taking responsibility. That ownership is again one of the main areas I would like to see our team improve. Our challenge is not our opponent but always ourselves," said Indian women's hockey team's chief coach Sjoerd Marijne. The last time India met Malaysia in a big event was at the 2017 Asia Cup, where it won 2-0 in the round robin league before winning the title in a tense final against China. "It is difficult to say how they play as we have not played against them in a while but the last time I saw Malaysia was during the Asian Games in Jakarta and that is a while ago. From what I saw there, they like to play long aerial balls and like to defend with a lot of passion," Marijne said. The matches between the two countries will take place every alternate day, starting Thursday. The final match of the series will be played on April 11.